At the heart of the Galactic Civil War, daring ace pilots risk everything in the fight for freedom. On the hangar deck, in the saddle, and behind the stick, these brave individuals take the fight to the evil Empire. Jump into the cockpit of your starfighter with Stay n Target. 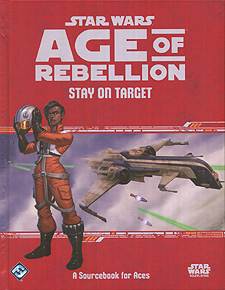 This rulebook expands upon the Age of Rebellion Roleplaying Game, adding new content for Ace characters as well as any character looking to master the many vehicles of Star Wars. Dogfight against dangerous adversaries, tame the wild beasts of the galaxy, and gain glory in the name of the Rebellion. Expanded character options including Motivations, Duties, species, and specialisations. New, powerful signature abilities that allow Ace characters to become masters of their career. Specialised equipment and dozens of powerful vehicles useful to characters looking to dive into a dogfight. Rules for riding the many beasts of the galaxy, along with profiles for the most common mounts used by the Rebel Alliance.